Stump Grinders & Tree Stump Grinding Services - Small, Large, etc. Why DIY? 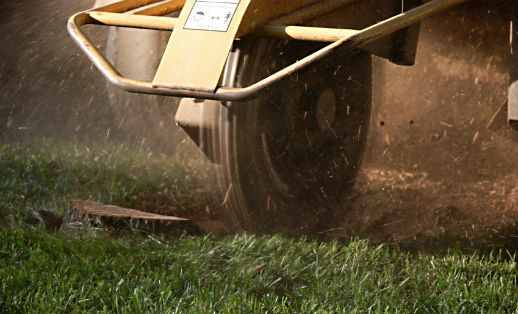 Get FREE quotes from stump grinding pros. Rent or Buy a Stump Grinder? If you’d like to do the work yourself your options are to rent a tree stump grinder or buy one. The former option makes sense if it’s just a one-time job. If you routinely do extensive yard work that involves chopping down trees and removing stumps though, it’s probably worth your while to buy a stump grinder instead. We recommend doing some number-crunching and determining if you will have enough jobs to pay for the stump grinder you want. Once it’s “paid for itself,” then each additional job will result in a profit for your business. Whether you rent a stump grinder, buy one or hire a company to do the work for you, doing a small amount of research can make the experience faster, easier and more affordable. Bemis Stump Busters took three stumps- including a 34″ diameter red oak – over the weekend for me. Took less than an hour for all three, ground them to below-turf level. Outstanding job, VERY happy. Was a spontaneousdecision – they were on our street when I drove by. Thank You again, Jeremy – I appreciate your work. stump and most of roots are exposed. I suggest hiring a local company for stump grinding can be a better option as compared to removing stumps yourself. Moreover, I think the tips you have shared what to look for with stump grinding services, are really effective. Thanks for sharing such an informative post. Hiring a local stump removal can be beneficial for you. They are professional in their work and are able to remove stumps effectively.